January 17th, 2019 – Lamacchia Realty is proud to announce Meghan Martin as the #1 Agent for Sales Volume in the Norwood office with 19 million in sale volume. “Meghan has taken this business by storm! I love seeing how well she is doing and how much luxury business she is doing. She is a great asset to our company in many ways,” stated Anthony Lamacchia, Broker/Owner Lamacchia Realty. Meghan was one of the agents that made the 2018 Lamacchia Realty Presidents Club. 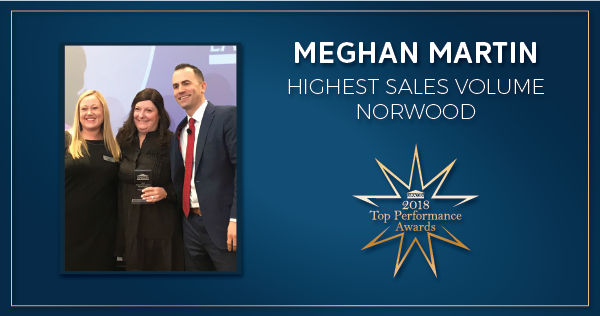 She was also awarded as one of the Top 3 Producing Agents for all of 2018 in the Norwood office. Click here to learn more about Meghan and watch her video.